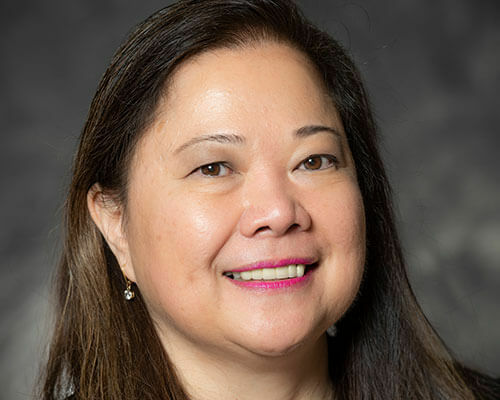 Home » Academics » Schools » College of Arts, Humanities and Social Sciences » Faculty » Angeli Willson, Ph.D.
Angeli Willson, Ph.D. was born in the Philippines and has gained a wealth of experience in the field of education throughout her life. She earned her Bachelor of Science degree in Physics from Ateneo de Manila University and went on to teach high school math for two years. Ready for a change of pace and scenery, Willson moved to New York City and taught first grade for nine years before moving to Texas. In Texas Willson taught first grade for 10 years and later served as an assistant principal for one year and a principal for five years. After more than 25 years of experience teaching and serving as a school administrator, Willson joined St. Mary’s University. She hopes to teach every student in her classroom to be passionate about reading and teaching reading. Willson believes reading and literacy are a fundamental to function in society. It is a vital skill in finding a good job and also develops the cognitive and aesthetic sides of the mind. When she is not teaching, she enjoys puzzles and traveling. Davis, D. & Willson, A. (2015). Practices and commitments of test centric literacy instruction: Lessons from a testing transition. Reading Research Quarterly, 50(3), 357-379. Willson, A., Falcon, L. A., & Martinez, M. (2014). Second Graders’ interpretation of character in picturebook illustrations. Reading Horizons, 53(2), 4. Prior, L. A. & Willson, A. (2013). Vivid portraits: The art of characterization in picturebook illustrations. Journal of Children’s Literature, 39(1), 53-59. Sailors, M., Kumar, T., Blady, S., & Willson, A. (2013). Chapter 2 – Literacy tools created and used within print rich classroom environments for literacy teaching and literacy learning. Handbook on Effective Literacy Instruction. B. M. Taylor and N. K. Duke. (Eds.). Guilford Press. Prior, L. A., Willson, A., & Martinez, M. (2012). Picture this: Visual literacy as a pathway to character understanding. The Reading Teacher, 66(3), 195-206. Horowitz, R., Blady, S. Willson, A., Kumar, T., Jackson, G., Prior, L. Fraga, L. M., Wittnebel, L. Mukunda, K., Gdovin, R., Root, D., & Schuetze, A. (2011). Review of Maryanne Wolf’s “Proust and the squid: The story and science of the reading brain. Education Review at http://www.edrev.info. Wilson, M. B., Blady, S. Kumar, T. Moorman, H., Prior, L., & Willson, A. (2011). Voices carry: A content analysis of Voices from the Middle. Voices from the Middle, 18(4), 9 – 16. Willson, A. (2010). Who wants to be a millionaire? : Clickers in the classroom. Voices from the Middle, 18(2), 74 – 76. Davis, D. & Willson, A. (2016). Interrogating and Resisting Test-Centric Literacy Instruction. Paper presented at the 2016 International Literacy Association Annual Pre-Conference Institute, Boston, MA. Willson, A. (2015). Children as authors: Incorporating creative writing in an afterschool book club program. Paper presented at the 2015 National Council of Teachers of English National Convention, Minneapolis, MN. Willson, A. & Falcon, L. A. (2015). An analysis of gender representation in Caldecott – awarded books, 1986 – 2015. Paper presented at the 2015 International Literacy Association Annual Conference, Saint Louis, MO. Willson, A. & Falcon, L. A. (2014). Racial and gender representation in picture books. Poster presented at the 2014 National Council of Teachers of English National Convention, Washington D.C. Prior, L. A. & Willson, A. (2013). The stories they tell: Deconstructing gender representation in picture books. Paper presented at the 2013 National Council of Teachers of English National Convention, Boston. Sailors, M. & Willson, A. (2013). Meet the expert series: Literacy tools created and used within print rich classroom environments for literacy Learning. University of Texas at San Antonio, San Antonio, TX. Davis, D. & Willson A. (2012). Developing a survey for characterizing reading comprehension instruction. Paper presented at the 2012 Annual Meeting of the American Educational Research Association, Vancouver, British Columbia, Canada. Prior, L. A., Willson, A., & Martinez, M. (2012). How pictures talk: Exploring character in picturebooks. Paper presented at the 2012 National Council of Teachers of English National Convention, Las Vegas. Sailors, M., Kumar, T, Blady, S. & Willson, A. (2012). Meet the expert series: Tools inside a print rich environment. University of Texas at San Antonio, San Antonio, TX. Ah-Gasem, N., Blady, S. Kumar, T., Nunez, I., Prior, L. Villareal, L. Wilson, T, & Willson, A. (2011). Designing a study of concrete literacy tools. Paper presented at the Second Annual IDS Colloquium, University of Texas at San Antonio, San Antonio, TX. Prior, L., Willson, A. & Dentith, A. (2011). The stories they tell: Picture books constructing gender. Paper presented at the 2011 Annual Meeting of the American Educational Research Association, New Orleans, LA. Willson, A., Prior, L., & Martinez, M. (2011). Children’s understanding of characters in picturebook illustrations”. Paper presented at the Second Annual IDS Colloquium, University of Texas at San Antonio, San Antonio, TX. Prior, L. & Willson, A. (2010). A gender analysis of Caldecott medal winners and honor books from 2005 to 2010: A post-structuralist perspective. Paper presented at the First Annual IDS Colloquium, University of Texas at San Antonio, San Antonio, TX. Davis, A. & Willson, A. (2009). Family reading nights as a means to motivate students and involve parents. Poster presented at the Literacy Coaching Institute, Texas A & M, Corpus Christi. Willson, A. (2009). The lives of exemplary women working in secondary Schools. Presenter at a Panel Discussion, University of Texas at San Antonio.